For the second week in a row, I am reviewing a book immediately after I finished it. 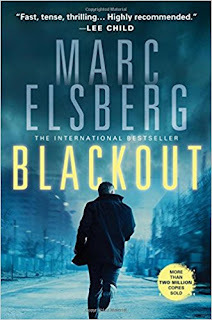 This time it is the the debut novel by Marc Elsberg, Blackout. I put this one to paper immediately for two reasons. First, it was just that good. Secondly, it was damn scary. This is a book that we should all hope never actually happens. Blackout was actually written in 2012 and published in Europe. It was finally published in the United States in June of 2017. After reading this book, my first question is, “Why did it take so long to be translated and published here?” This book shows in raw detail what would happen if the power infrastructure in Europe were to be hijacked and held ransom by hackers. In Elsberg’s world, it is a truly frightening experience, with humanity's baser predilections rearing their ugly heads. The story skips around to various groups of people after the power grid starts to fail. From simple families stuck in darkened homes, to governmental officials, to hackers both trying to save and obliterate modern society, we get a taste of the impact of the event from several points of view. The main story, however, really revolves around hacker Piero Manzano and reporter, Lauren Shannon. Somewhere, hackers have infiltrated the power grid that services most of Europe, disrupting service for millions of people. Panic almost immediately ensues as the lights blink off across the continent. Most of the panic initially comes from the power station technicians as they watch helplessly as their charges fail. Soon, however, the masses begin to rise up against the lack of heat, light, and water during the height of winter. Manzano thinks he knows what has caused the widespread outage and attempts to tell the authorities. As a former hacker, he is under suspicion as soon as he shows up at their doorstep. Efforts by the original power grid hackers throws even more doubt onto Manzano’s sincerity and he ends up in custody rather than continuing to assist in solving the issue. While the drama between Manzano and the authorities continues to grow, new problems at regional nuclear power plants threaten even more swaths of the continent. At this point, some governments had stated they can no longer effectively continue to govern, so they hand the reigns over to the military. Bedlam has broken out among the masses, with bribery, thievery, and murder becoming the norm in order to survive. Finally, the tide is turned with Manzano’s assistance, and the power starts to come back on. In the aftermath, economies worldwide are in shambles. It could take decades for the markets to rebound, and centuries for some areas of Europe to be safely settled. The damage is wide, but it could have been worse, plunging the world back into pre-industrial revolution levels of civilization. This book is scary for the simple fact that any of this story could actually happen. Globally, we’ve tied our power infrastructure together with computer systems. If we’ve learned anything about computers is that no matter how impermeable the firewall, there’s always a sliver of light for the best hackers in the world. That leaves us vulnerable. Additionally, the breakdown in civility comes pretty quickly. We’ve all been coddled by the ease of our lives. Takes our comforts away, and watch how quickly we become unhinged. Take for example the extended power outage we had in Lockport this spring? Immediately, people were up in arms about the power companies not being prepared for it, throwing blame around for a freak storm that took out over 1,000 telephone poles in Western New York. We like our comfort, and this novel shows the stark reality of what happens when that is taken away. Marc Elsberg’s novel, Blackout, seems like it could be ripped from the headlines. Hopefully, we will never have to live through a scenario like this, and that the people in charge continue to make changes to the security of our infrastructure. This novel is a warning of what could happen if these things are not taken seriously. I know it’s fiction, but I hope they are listening, reading, and adapting. Craig Bacon sometimes likes those quiet evening lit only by candlelight, but he doesn’t want to live that way all the time.